Camp shirt? Check. Sneakers? Check. Appetite for adventure? Check, check, check. Pack up the mess kit and head for the Pocono Mountains. Your child is going to summer camp! Surrounded by the beauty of the lush mountain landscape, the region’s summer camps provide safe, educational environments for activity and adventure. Varied programs and settings cater to campers’ unique interests while promoting socialization and new experiences in the great outdoors. From adventure sports at Blue Mountain Resort, International Sports Training Camp, and Wayne County Camp Alliance to swimming and hiking at Trout Lake and Mt. Gilead and fireside fun at Spruce Lake, summer camps create moments that turn into memories. Give your children something to write home about! Send them to summer camp in PA in the Pocono Mountains! 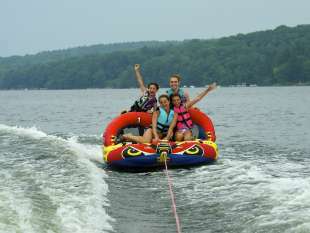 Before you send the kids off to summer camp, enjoy an exciting family vacation in the Pocono Mountains.